I was lucky enough to train with Nike Chicago for the Bank of America Shamrock Shuffle as an opportunity to try out the new Nike Epic React Flynit shoes; the running shoes are made with the brand’s special React foam to give runners stability and responsiveness, while also being extremely lightweight, so I was eager to test them out in both training and racing. Read more about the design behind the popular shoe here. My journey began about five weeks prior to the Shamrock Shuffle. We met with our Nike + Run club coaches Emily Hutchins and Dave Carson as well as our Nike rep Heter Myers who presented us with some Nike workout gear; we received the new Nike Epic React Flynit shoes, some Nike tops and bottoms, a Nike bag and a couple of foam rollers — if this isn’t motivation to start a new racing season, I don’t know what is. 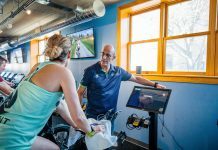 Over the five week period, Coaches Emily and Dave developed a workout plan for our group which consisted of 12 people, forcing us to work together and push us to our limits to tackle the ultimate spring kick-off race. 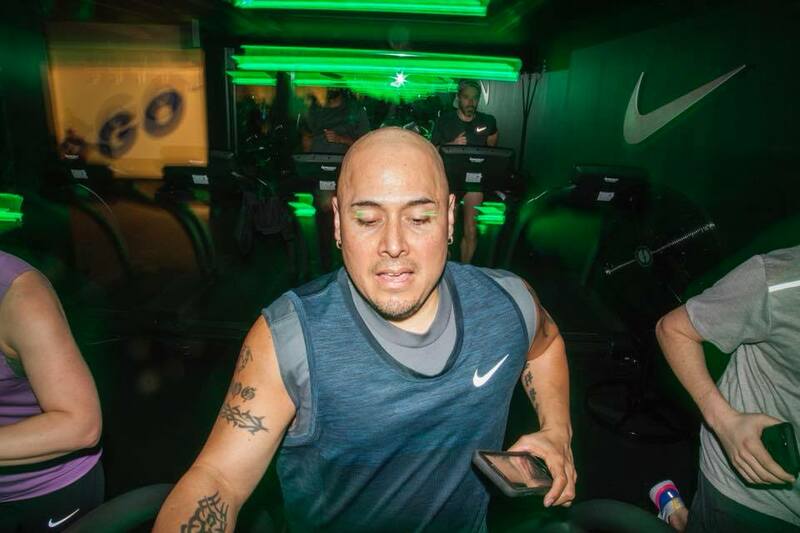 Me running at the Nike House of Go pop-up downtown. 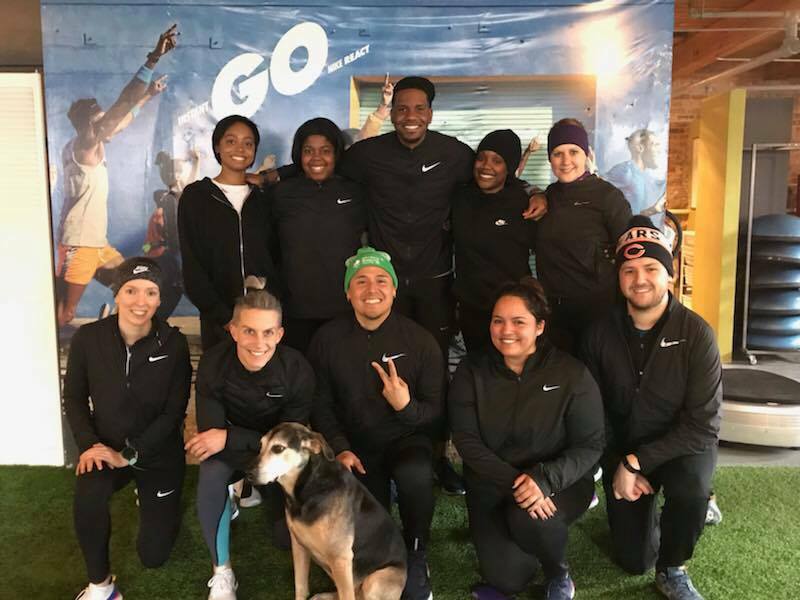 During those five weeks, we met twice a week: once at On Your Mark Gym downtown on Wednesdays, where we would work on running intervals and strength training; on Saturdays, we met at the Nike House of Go, a pop-up warehouse with interactive treadmills and other stations to really maximize the features of the Nike React. Here, we worked on cross training and running intervals in cool lighting while listening to fun music. As far as the shoe goes, I loved them immediately. It truly does provide the perfect cushion and stability, but isn’t too heavy, even during the interval training sessions. Obviously, the shoe and Nike coaches can only do so much during the two sessions a week, so the rest of the training was up to us individually. We were given a training plan with assigned mileage to complete throughout each week, which was helpful. In fact, I also was training for the LA Marathon, so my #NikeReacts were getting a lot of miles put in, and holding up! Finally, March 25 came, and it was the Bank of America Shamrock Shuffle race day. It turned out to be cold and windy, but that did not stop me from running a great race, and eventually setting a new 8k PR for the Shamrock Shuffle! I obviously have to credit the Nike Reacts for this progress, along with the fabulous coaches Emily and Dave for whipping us into better shape. I had a great time with the other runners in the group, and congrats to them for also completing the 8k race! I can honestly say that this five-week experience has redefined running for me for the rest of my life. Edward is a very enthusiastic runner who has been running for20 years. He is part of the Fleet Feet Racing Team in Chicago, and is also a member of the Marathon Maniacs, trying to complete the ultimate goal of running a marathon in all 50 states one day. Currently, Edward has completed marathons in 10 states, 24 total, and also has done over 100 half marathons.